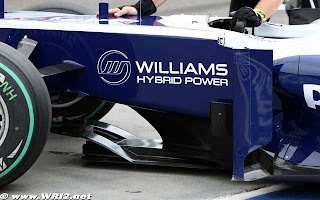 The Williams Formula One team has made the switch from the flywheel unit it has been developing for the past two years because of the packaging opportunities battery power offers in the wake of the refuelling ban at the end of last season. The team had previously committed to running KERS in 2011 back in September, but technical director Sam Michael said at the time that both battery and flywheel derivatives remained an option. Williams co-owner Patrick Head has confirmed that the team has opted for the battery version in 2011, because it is easier to package now F1 cars must carry larger fuel cells than they did two years ago. "I think it's fairly well known that we're going to be running a battery system," said Head. "Had we run KERS in 2009, it would have been a flywheel-based system. "The flywheel, by the very nature of what it is, has a cylinder of a certain diameter. "The weight is actually lighter than a battery for equivalent power and energy storage. But the batteries, because they're made up of lots of little cells, we can make it large and flat, we can make it small and tall. We can put it into any shape. "Once refuelling was banned in Formula 1, it made it quite difficult to fit a flywheel into a Formula 1 car. Albeit we've got a number of programmes going, including the successful Porsche GT3R hybrid one, where the flywheel is happily fitted into sportscars, and other types of car." Head has not ruled out Williams introducing its flywheel-based system in the future however and suggested that it might be more suited to the next raft of technical regulation changes expected for F1 in 2013. "From what we understand, there's likely to be a much higher-power KERS system; 120 kilowatts we hear, a much higher energy storage, a much higher stored energy level - we've heard figures from 2.3 megajoules to 4 megajoules allowance," explained Head. "Whereas at the moment it's 400 kilojoules, so possibly up to a factor of 10 the amount of energy you can store. "It would be a very different thing. You've still got to harvest that energy, so..."
"None of these figures is fixed yet. If the engine is a four-cylinder turbo engine it may well be that there's a possibility of installing the flywheel. If the design of the cars allows us to install the flywheel, we'll look at it again as a possibility for Formula 1." Now just add a solar panel..